The castle of the Knights of St John, built in C15, stands in front of the harbour with a narrow passage to the north. South of the castle, a bridge over the beautiful Avenue of Palms links the castle with the square where the plane tree of Hippocrates stands. Tradition says, that it was planted by Hippocrates and that he taught medicine in its shade. Next to Kos harbour, you will find the Ancient Agora (market), built in order to facilitate trade. An impressive stairway leads from the road to the internal courtyard. Two restored columns form a portico. It is thought that construction began around 3 BC, while the few pieces from the buildings that have been preserved clearly show many construction periods. 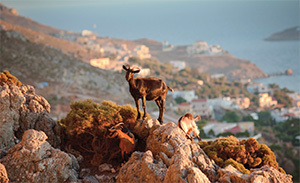 Some of the most picturesque villages in the Dodecanese.